The Sunnfjord area is a mix of active holiday in diverse and unspoilt nature, attractions like a viewing point of unseen architecture, and compact urban charm. You will find Sunnfjord ideally situated halfway between the major cities of Bergen and Ålesund, bordering to the Sognefjord area in the south and Nordjord in the north. Take your pick amongst the many possible highlights of your vacation, or just kick-start it by participating in an exotic glacier hike at Haugabreen. Other activities include kayaking, rafting, hiking, and guided tours. In Jølster, you can in fact get your very own fishing guide to show you the best spots for catching trout. In the winter, the mountainous landscapes of Sunnfjord are great for most types of skiing. Just remember to familiarise yourself with the mountain code beforehand. Drive to Utsikten viewpoint, an attraction at the National Tourist Route Gaularfjellet. Here, raw nature is combined with dazzling forms signed by the recognised Code Architecture. The Sunnfjord area is often called “the home of waterfalls” because of the numerous places where water cascades off the steep mountain sides and splashes into Norway’s longest and deepest fjord, the Sognefjord. Inhale cultural input at sites like Sogn & Fjordane Art Museum, the open air Sunnfjord museum with its 25 historical buildings, or at concerts and other events at Astruptunet and Villa Aamot. In Sunnfjord, history buffs will also find pleasure in visiting Viking and medieval sites. Be sure to taste local delicacies produced by food enthusiast like the traditional Naustdal dampbakeri in the city of Førde. In July every year since 1990, the Førdefestivalen is a multicultural musical event that is highly popular amongst both locals and travellers. In Førde you will find most of the services you expect from a modern city. The accommodation offers in Førde and the rest of the Sunnfjord area are as varied as the landscape, from camping sites with cosy cabins to hotels dedicated to total comfort. There are several ways to get to the area. Find more inspiration on Sunnfjord’s official website. Hestad chapell, National Tourist Route Gaularfjellet. Get in-depth travel information on Sunnfjord’s official website. Even though there is no railway in the Sunnfjord area, there are several possibilities for combining train with bus, car, and ferry travel. The Bergen railway is connected with the renowned Flåm railway, and from Flåm you can take a ferry to Sunnfjord. An express ferry runs between Bergen and Florø, and from Bergen to Rysjedalsvika, with bus connections to Førde, the area’s biggest city. The coastal express Hurtigruten calls in Bergen, Florø, Ålesund, and Trondheim. Nettbuss Express travels between Oslo and Førde three times a day. 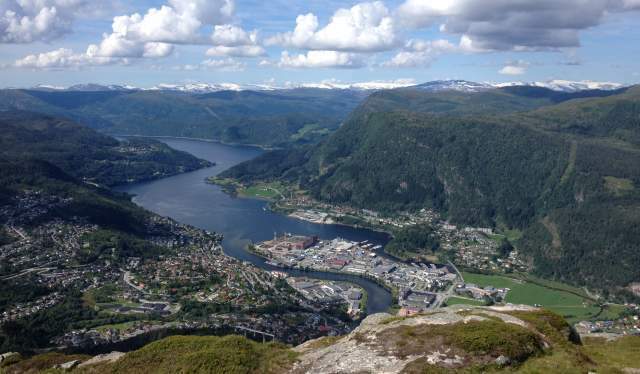 Fjordekspressen offers numerous connections within the area and to major nearby cities such as Bergen, Trondheim and Ålesund. From Oslo to Sunnfjord via Hemsedal (E16 and E39), the distance is 420 kilometres. From Bergen, follow E39 to Sunnfjord. Distance 175 kilometres. From Trondheim via Otta to Sunnfjord (E6, Rv15 and E39), the distance is 525 kilometres. From Ålesund, follow E39 to Sunnfjord. Distance 200 kilometres. National Tourist Route Gaularfjellet runs from Balestrand to Moskog and from Sande to Eldalsosen, a total distance of 114 kilometres. Parts of the road is closed during winter. Frequent flights connect the area’s major city Førde with Bergen Airport (30 minutes flight) and Oslo Airport (1 hour). From Oslo to Sunnfjord via Hemsedal (E16 and E39), the distance is 260 miles. From Bergen, follow E39 to Sunnfjord. Distance 110 miles. From Trondheim via Otta to Sunnfjord (E6, Rv15 and E39), the distance is 325 miles. From Ålesund, follow E39 to Sunnfjord. Distance 125 miles. National Tourist Route Gaularfjellet runs from Balestrand to Moskog and from Sande to Eldalsosen, a total distance of 70 miles. Parts of the road is closed during winter. The coastal climate of the Sunnfjord area makes the winters mild and the summers relatively cool. January and February are the coldest months, with an average temperature of 1°C. Note that the winter temperatures can drop to around -10°C. Some of the roads in the area are closed during the winter months, including the National Tourist Routes. June and July are warmest with an average temperature of 13°C, but with temperatures up to 25°C on sunny days.